Government of Baluchistan has announced 256 New Government Jobs in Provincial Head Quarter and Division of Baluchistan and its District in Daily Express Newspaper 07/02/2018. Candidates fulfilling the required Criteria may apply for Agriculture Department Jobs 2018 by sending their application to the office of Agriculture Training Institute A.T.I Saryab Road Quetta before given date and time. Only Baluchistan Domiciled Candidates can apply for these jobs. Interested candidates can apply for following posts. 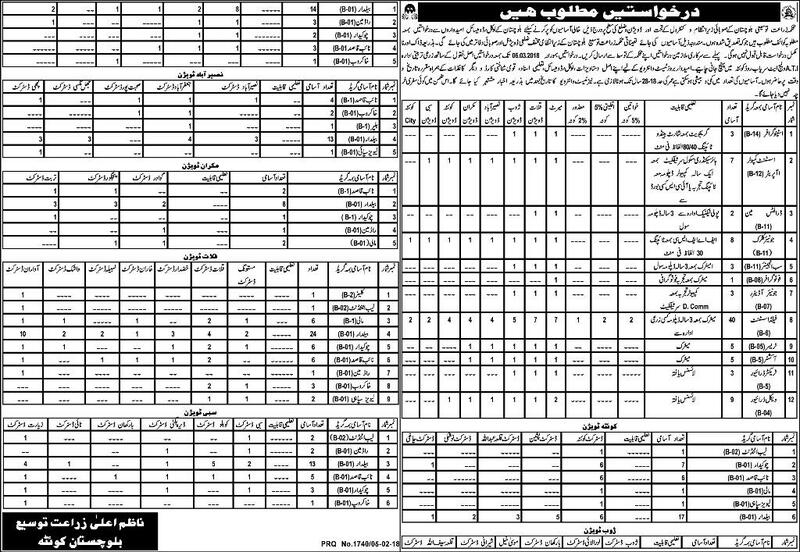 Stenographer, Assistant Computer Operator, Drafts Man, Junior Clerk, Sub Engineer, Photographer, Junior Auditors, Field Assistant, Tracer, Auctions, Tractor Driver, Vehicle Driver, Lab Attendant, Chowkidar, Naib Qasid, Gardener, Levies Soldier, Baildar, Sweeper and Rodman.